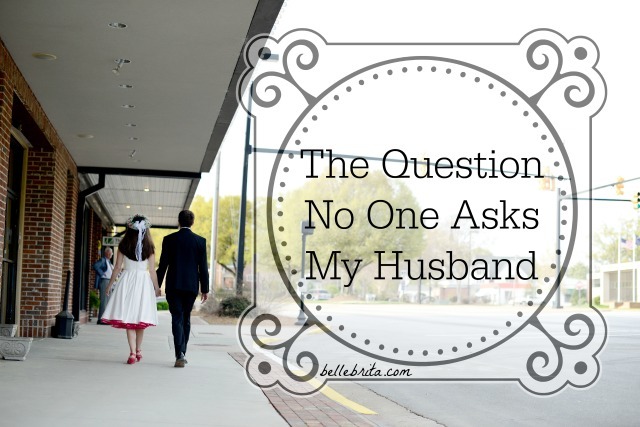 You are asking me a question that you would never ask my husband. That's practically the textbook-definition of sexism. Why didn't you change your name? Why didn't you want to take your wife's last name? Strangers feel entitled to know why I made a choice that doesn't affect them in the slightest. Um, Brita? Didn't you start the conversation with your satire? Don't you always ask for comments and questions? Surprisingly, not that many people responded to my satire by asking me why I kept my last name. If anyone did, that didn't bother me, because it was relevant to the post. But people have been asking me this question long before I had my 15 minutes of fame, and they still ask me, even without having read my satire. Like I said, even strangers feel comfortable asking my husband why I didn't take his last name. Asking me why I didn't change my last name is sexist. But that's not the only reason why asking me about my last name is sexist. Why did you even get married if you didn't want to change your name? I do feel like feminism has made some progress here. Like my friend Kelly pointed out in her own post on the subject, the fact that people ask her if she's changing her name or not is a win for feminism... Even if they're not asking her fiancé the same question. Until we take a few more steps forward, I'll keep innocently explaining that my husband didn't feel like taking my last name. It's amazing how people react when I say that! But hey, if you're still dying to know why I kept my last name, I'll give you a hint as to one of the many reasons. Google "galaxy Brita Long," and yes, you'll need those quotation marks in the search bar. Would you give that up, just for the sake of "tradition"?